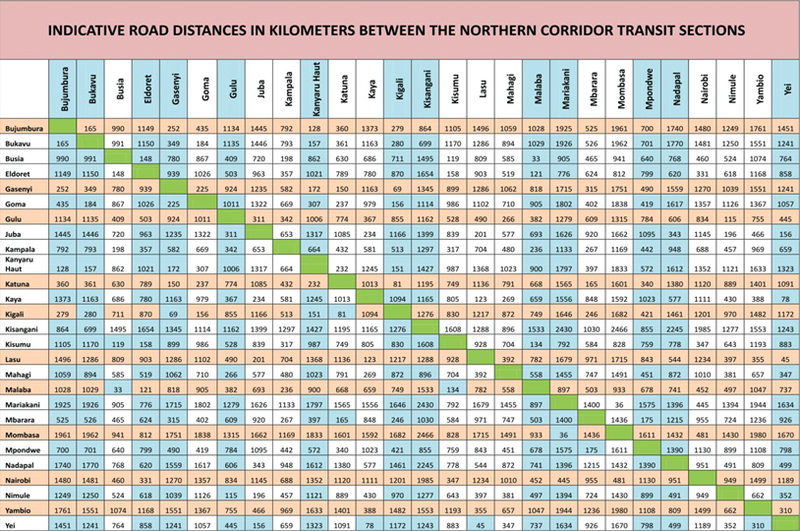 The Northern Corridor road network in all six Member States is approximately 14,108Km in length distributed as follows: 463 Km in Burundi; 5,176 Km in DRC; 1,710 Km in Kenya, 781 Km in Rwanda; 3,691 Km in South Sudan and 2,287 Km in Uganda. According to data collected from the roads authorities only 28.4% of the road network is in good condition and 63.6% is in bad condition. However the main trunk road which carry more than 90% of traffic is in good condition. The Member States should consequently be advised to prioritize on improving the quality of road networks in order to improve the regional trade, investments and trade and spur economic development along the region. And as the freight sector continues to grow, its logistics costs and environmental impacts also increases in parallel. The Northern Corridor handles a substantial volume of trade including intra-regional trade that, as an illustration, reached over 5.4 million tons in 2014. The daily traffic volume for heavy trucks (both outbound and inbound) at Mariakani Weighbridge, for example, is over 5,000 trucks. Key transit transport routes are from Mombasa to Bujumbura (the South-West terminus) covering about 2,000 km of road distance, and the Mombasa - Kisangani route which stretches for about 3,000 km. The bulk of imports and exports destined to and from countries in the Corridor are transported through either of these transit routes. From Kenya to Uganda, the Mombasa - Malaba - Kampala road (1170 km) is preferred due to the relative good quality of the network and availability of social amenities en route. The alternative route is Mombasa - Kisumu - Busia - Kampala. From Uganda to Rwanda, the principal routes are Kampala - Kagitumba - Kigali and Kampala - Gatuna - Kigali, Bujumbura in Burundi is reached from Kampala through Rwanda. Bukavu, Goma and Kisangani are reached from Rwanda and Uganda as well.